As you may know, the Liberals under Justin Trudeau plan to impose their version of electoral reform on Canadians, without securing the consent of Canadians through a referendum. As Her Majesty’s Official Opposition – and as Conservatives – we have an obligation to raise the alarm about this undemocratic plan. 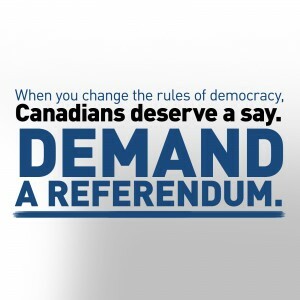 The only way for every Canadian to be heard is through a Referendum. Canada is one of the most stable and admired democracies in the world. Any change to what our vote means can only be made with the consent of the people. The Prime Minister doesn’t believe he needs the consent of Canadians to change what their vote means because he thinks Liberals know better than everyone else. It is unacceptable to push through unprecedented changes to our democracy without the consent of Canadians. It must be stopped. I encourage you to circulate the attached petition to garner support for a referendum. Demand a Referendum on Electoral Reform, e-petition here.